If a book called How to Write About Music sounds like something you’ve just got to read, chances are you’re already writing about music. 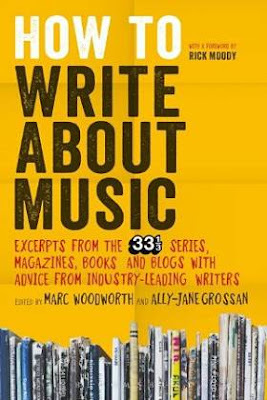 That said, the perspectives shared throughout this 400-page compendium from the folks behind the sensational 33 1/3 series of album dissertations (published by Bloomsbury, edited by Marc Woodworth and Ally-Jane Grossan) is both useful and, particularly to emerging writers, enlightening. Indeed, while presented essentially as a combination textbook/workbook, what lay within doesn’t instruct so much as it surveys various types of music writing while offering practical insights from some of the trade’s most renowned, influential (and, at times, pretentious) exponents. Along the way the reader will encounter everything from critical reviews to personal essays to artist interviews and profiles to consolidated cultural studies of select musical touchstones and themes — in other words, everything from the most traditional forms of music writing to its most avant-garde expositions. There’s even a chapter on how to pitch a 33 1/3 series book, including sample proposals. Ultimately, though, if How to Write About Music yields one unifying theme it’s that there is no one correct way to write about music, but the book nevertheless provides invaluable context and encouragement to those with a passion for the craft.